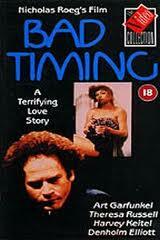 There is nothing easily definable about Nicolas Roeg’s perverse romance Bad Timing, right down to that inscrutable title. This is a film about lies, distortions, and manipulation, not anything as fickle and uncalculated as bad timing. The title is just more deception in a film that considers it elemental to human nature, and embodies it in form and style. Bad Timing is assembled from the memories and assumptions of multiple unreliable sources, and the flamboyantly cinematic camera moves and angles, shock-cut edits and Scorsese-esque soundtrack contribute to a sense of dislocation. It is a film about two Americans who meet in Freud’s Vienna, but it also daytrips in Morocco, and throughout feels unstuck to notions of time, space, and knowable truths. An early scene of Theresa Russell symbolically “divorcing” her Czech husband (played by Brit Denholm Elliott) as they cross and re-cross the Austrian border indicates that all borders have been rendered moot – between beginnings and aftermaths, between memory and reality, and in one especially disturbing scene, even between sexual penetration and an emergency tracheotomy. “I don’t think it was a lie, it was words,” says the damaged and beautiful blonde Milena (Russell). Milena is the object of carnal obsession for every male in the film, especially Art Garfunkel’s brittle professor Alex Linden. Memory bleeds in powerfully and unexpectedly, like a heart pang or a headache, and the first flowering of romance between Alex and Milena is intercut with her possible death by suicide. Roeg bisects the narrative into two different perspectives, both of them biased and unreliable. The first half builds the story of Milena and her imminently tragic conclusion through the memories of Alex, while the second half follows the process of a police detective (Harvey Keitel) investigating Alex for her possible murder. But we see that Alex’s memories are profoundly distorted by self-preservation and denial (he works at the Sigmund Freud Museum and literally teaches the class on voyeurism), and the detective’s Laura-like obsession with the mysterious Milena has a similar effect on the case. Russell is very good as the film’s emotionally disturbed muse, desired, pursued, un-captured, and yet ultimately betrayed by every male in her life. Keitel is quietly brilliant as the detective, gradually moving from by-the-book professionalism to all-encompassing obsession, as though there was no difference between the two. Garfunkel is a weakness, a beautiful figure to photograph but very deliberate in his mannerisms and delivery, and I felt like I could see him working out each gesture and movement in his head. That stiff self-awareness actually worked for his character in Carnal Knowledge, but Roeg asks him to wrestle above his weight class here. However, that’s the only major fault of this invigorating and upsetting film. Towards the end, Keitel compares a debased morality to “an infectious disease,” and some of the third act revelations are disturbing enough to make you believe such a thing is possible. In a final perverse touch of deception, Roeg closes the film with Billie Holliday singing “It’s the Same Old Story,” a song of first love with lyrics like, “It’s all fun and laughter/They lived ever after in ecstacy”. Spoiler alert: not so much!